The Garmin Fenix 5 is one of the most powerful multisport outdoor watches available, blending some of the most detailed metrics into a single device. In reality, it's only a minor upgrade from the ageing Fenix 3 HR, which itself was so powerful that Garmin has needed only to make a few tweaks. Size and design are the main areas that have been addressed, and the Fenix 5 makes better use of Garmin Connect IQ to become a more personalised, wide-ranging sports watch. It costs a bomb too. With the Fenix 5 starting at $599, it dwarfs rivals such as the excellent TomTom Adventurer and the new Garmin Vivoactive 3. But how does the Fenix 5 stack up? We spent a few weeks getting it sweaty to find out. Praise be to the gods of progress and miniaturisation because Garmin has succeeded in shrinking the Fenix 5 from its previous iteration. The Fenix 5 is significantly smaller and lighter than the Fenix 3 HR (no, you didn't miss the Fenix 4 – it never existed), and is certainly easier and more pleasant to wear. At 47mm it's still massive, but not quite as unwieldy. While the Fenix 5 delivers plenty of benefits for all-day wear, it's still hardly a looker. Industrial and bulky, there are five actual screws in the bezel. But the lighter and smaller design does mean that you can get away with all-day wear, and those who identify by their love of the outdoors could turn it into their permanent watch. There's still a colour screen and the visuals look a tad sharper, thanks to the new resolution of 240 x 240, upped from 218 x 218. At first glance you might not notice the colours – they're used sparingly yet to good effect in screens like heart rate zones and menus. There are still five buttons to control the menus, which can be a little confusing at times. Even after a couple of years of using Fenix watches, we're still finding new context menus and can't quite get used to waiting five seconds after pausing a run for the 'end workout' option to appear. What's more, the placement of the stop/start button catches too easily on sleeves and bags, which can unwittingly pauses runs or hikes. As you might guess from the design, the Fenix 5 is water resistant to 10ATM, which roughly equates to 100m. The Fenix comes with a rubber strap as standard, which is interchangeable. We found it comfortable and durable in testing, but it did have an annoying habit of falling out of its buckle loop and flapping about. Watches don't come more feature-packed than the Fenix 5, but it's the sports tracking that steals the show. When you set up for the first time, the Fenix 5 will ask you to choose the activities you wish to have on your menu. The options range from the obvious – running (outdoor, indoor, trail), cycling (indoor, road, mountain bike) and swimming (pool, open water) – to other sports including golf, skiing, triathlon and – get this – even parachuting. It's hard to find a sport that the Fenix 5 doesn't track, and luckily, you can set favourites for a more personalised and focused sports menu. They can be added to at any time from the main menu. We've dissected most below for your perusal. Activity tracking is also a huge part of the set up, and thanks to the heart rate sensor that's built in, these stats are particularly rich. Again, more on that shortly. But in addition to sports and fitness tracking, the Fenix 5 does a great smartwatch impression. Notifications from your phone will be pinged to your wrist, although you can't read these in full. However, unlike Fitbit the Fenix 5 isn't fussy about what it displays. If it hits your phone's home screen it will get pushed to the watch, and it's sometimes nice to get message notifications when you're out hitting the trails. If you don't want them, just set your phone to Do Not Disturb. With your phone paired, you also get updates such as weather and calendar events synced to the watch, which can be accessed by cycling through the home screens. It's a nice touch and brings your Fenix to life. Like the TomTom Adventurer, you can also upload GPX/TCX files for hiking or walking routes. The process is a tad more convoluted than the Adventurer, and it actually took clarification from Garmin on how to do it. We're prepping a full guide, but you need to grab the Garmin Basecamp software first. It means with a little faff, you can add to the Courses section of your watch. Of course, you can use Garmin's built-in software, which is found on the web dashboard. It's actually pretty close to Strava's, once you get past the initial UX carnage, but we do prefer the latter's. However, the GPX upload means you can grab hikes and walks from the web, which is a feature we love. Despite the huge array of tracked sports, running is arguably the Fenix 5's strongest suit. In a way the Fenix 5 brings the best of all Garmin's disparate specialist watches into one device, so the running data is formidable. Aside from all the bog standard pace, splits, time, distance and heart rate, there are live read outs on your Performance Condition (displayed a few minutes into your run), and heart rate training, so you can set your own zones and receive alarms if you drop out of them. If you pair up with a chest strap, you'll also get vertical oscillation and cadence data. After a run things get even better, with training effect and VO2 Max, which are some of the best out there. What's more, Garmin won our VO2 Max group test when put up against a sports science lab, and with it acing most of our heart rate testing, there's no reason to doubt its accuracy on the Fenix 5 either. Recovery is also a big part of the running metrics, and the Fenix 5 will advise you on how much rest to get after each training session. To be honest, this is something we felt was a little weak. For whatever reason, health and safety probably, the Fenix 5 recommended huge periods of rest after the most mundane training runs, often between 50 and 72 hours after a gentle 10K. This comes from FirstBeat's algorithms taking data from personal heart rate performance, but we do feel that if we listened to the Fenix, we'd never get any meaningful training done. We'll tackle the accuracy of this data below, but as a running watch, things don't get much more complete or detailed than the Fenix 5. Yes, it's data overload, but the Garmin Fenix 5 manages to make this sheer amount of information manageable, and that's some achievement. When you set off on your hike you can access pace, distance, time and elevation as well as a live compass and mapping. It's a pretty complete set of hiking features, and you can add in GPX route uploads and have a live route plotted of your rambles, too. The level of data hardly matches the level of insights for runners, cyclists and swimmers but it's the longevity of the Fenix 5 that really impresses. Battery life is the key for hikers and trekkers, and sadly, we can't quite vouch for the Fenix 5's performance here. We managed around 14 hours of fully GPS tracked hiking in our testing, but when we tried to put the watch into UltraTrac mode, we got exactly the same level of battery drain – clearly something is awry. Garmin says you should get 60 hours of UltraTrac – so for multi-day hikers, the jury is still temporarily still out. As we mentioned, the Fenix 5 brings in the best of Garmin's frightening rostrum of devices, and swimming and cycling is equally on-point. We've already rewarded Garmin's slew of devices for best-in-class swimming support, and that continues here. Once pool lengths have been input, you can get indoor metrics including stroke count, stroke type, and SWOLF – the magic score for the optimum number of strokes per length. You also get alerts and buzzes on the watch when you hit certain markers, but don't expect that optical heart rate sensor to work properly in the pool. If you want that workout intensity data then you'll need to invest in either Garmin's HRM-Tri or HRM-Swim heart rate chest strap. We put it to the test against the TomTom Spark 3's swim tracking skills in the pool and were pleased the results. Once you've selected the correct pool length, you're good to get tracking. There's the same data fields that popped up on the Fenix 3 and the Vivoactive HR and the big display makes it really easy to soak up data during a session. The accuracy was strong, particularly with the lap counts and stroke detection proving once again that Garmin is still on top when it comes to swim tracking. The Fenix 5 is also a powerhouse for cycling. While you can get the standard distance, time and elevation gain just by wearing the watch, it also hooks up to Garmin's ANT+ and now Bluetooth power meters and cadence. We'll admit, we didn't take the Garmin Fenix 5 skydiving, even though there is an app for it. There's an app for everything, when you consider the power of Garmin Connect IQ. But one of the core sports is golf, something that interested us as enthusiastic users of Garmin's Approach range of GPS golf watches. And what do you know, the Fenix 5 apes them as well. In fact, we really enjoyed the visual nature of the golf apps interface, more so than the Approach S20 and Approach X40. You can still get lay-up, hazard and measurement features, just as you would on high-end Garmins. Okay, it's missing the swing analysis from the Approach S6, but you can sync it with the TruSwing for a wrist-based data feed while down at the range. All in all, a hole in one for the Fenix 5. General fitness tracking is also a big part of the Fenix 5's remit and is similarly data packed. Steps and sleep are both tracked automatically, but also resting heart rate (RHR) – your last four hours and past seven days RHR is shown on the watch itself, as well as being recorded in Garmin Connect. Seen not only as a great measure of improving fitness, resting heart rate spikes can also indicate the need for a rest day in your training schedule, and it's presented superbly here. We also found our RHR to be in line with the Fitbit Alta HR, and reassuringly constant. You can also drill down into your daily stats on the watch, including active minutes, flights climbed, steps and calories burned. For those who take training seriously, the Fenix 5 also presents your VO2 Max, recommended recovery and race prediction times among the general fitness stats, something that will be hugely enjoyed by serious runners and cyclists. But there are another two metrics among the line-up which are well worth your attention. Training Load measures how much you've been hitting your straps and whether that's insufficient, optimal or too much for your training. This is based on FirstBeat's technology, and spits out an arbitrary number plus advised training intensity for your next session – examples include light run or to train as normal. Training Status does much the same, but offers the key piece of insight into your training: are you getting fitter, or losing your edge? This is a great motivator, and while our steady training only fed back 'productive' (e.g. getting fitter), you can also get readings for 'unproductive' (if you're losing fitness) and 'peaking' when you're really making gains. After a workout, you'll also get a rating out of five for the Training Effect (TE) and Anerobic Training Effect. For most wannabe athletes this is too much information – let's face it, most of us know how much a workout hit our bodies straight after a workout, but for those that crave that extra data, it's a decent stat. We've written reams about heart rate accuracy here at Wareable, and it's an issue that raises its head with every new device. The Garmin Fenix 5 uses the company's Elevate optical sensor built-in, which has come in for a bit of stick in the past in our testing. And sadly, the same issues remain here on the Fenix 5. But let's start with the good. Resting heart rate, as we've mentioned, is pretty seamless and has reported in line with Fitbit devices we've tested at the same time. So far, so good. When you take the Fenix 5 out for a run, things start to fall down. Just as we found with the Garmin Forerunner 235, Vivoactive HR and Vivosmart HR, the Fenix takes around one mile/10 minutes to laser onto a chest strap. In this period readings can be in the region of 20bpm below a real reading, before they snap back to reality. As long as you don't start to quickly cause sudden peaks in your heart rate, your readings should be fine after this. Accuracy during HIIT was also quite poor. We ran five one minute on, one minute rest intervals versus a chest strap-equipped Fenix 3 and found that the Fenix 5's optical sensor was pretty wide of the mark. As we were peaking at 192bpm, the optical sensor rarely registered past 170bpm, eventually peaking at around 180bpm. The fact that optical isn't suited to high intensity training is pretty well-documented, and the Fenix 5 does offer the ability to pair with both ANT+ and Bluetooth HR sensors. If you do HIIT, use a chest strap. But the performance of the Fenix 5 sensor at the start of general runs casts doubt about the wonderful array of data elsewhere. For example, there was a drastic difference in the Performance Condition displayed between the Fenix 5 and Fenix 3 with chest strap in our comparison runs. What's more, VO2 Max differed slightly, too. They're small differences, but the optical sensor quality does stop the Fenix 5 being a five-star device in our eyes. Garmin Connect is not only the platform used for the Fenix 5's data, but is also a gateway to the company's big range of tools and features. There are two main elements: the smartphone app and web dashboard. And they do different things. The app is used for viewing your activity data and digesting the workout, and offers a stripped back experience. It's not the most user-friendly experience, but you can swipe for steps, sleep, active minutes and so on from the main screen, plus dive into specific workouts, looking at performance data, maps and graphs. Even as a regular runner with Garmin, I still have my workouts pushed to Strava, because I enjoy the experience of viewing runs there. Yes, if you want to dive into those niche data fields (vertical oscillation, cadence, Training Effect) Connect is the only option, but as an average runner, I get my fix of these stats on the Fenix 5 after the run. The web dashboard is a different story. Here you can dive into deeper detail on workouts, create schedules and training plans, build routes and bring all your sports into one place. What I love here are the tools, despite rarely using them outside of reviewing. The Courses feature, as mentioned above, enables you to build routes to follow on the watch and in the Training option, you can create plans and schedules for almost every kind of race. We'd like to see an overhaul of the mobile app to make things a little more visual, and an effort to cut through the data and provide real-world analysis would be beneficial across the board. But in general, we're fans of Garmin Connect and feel that users get a decent experience. Despite the shrink in size from the Fenix 3, the Fenix 5's battery longevity hasn't been affected. Garmin boasts that you can get two weeks of battery life from the Fenix 5 as a watch and that very much stands up. But no-one should be forking out $599 for a watch – not one this ugly, anyway. What counts is the amount of sport you can get through. We found that when running, cycling or hiking using full GPS tracking, the Fenix 5 would last around 14 hours – less than the stated 20 hours from Garmin. However, this was with Bluetooth connected and all settings set to default, so you could probably eke out a few more hours. It should get you through all but the toughest ultramarathons. We've run into problems with UltraTrac, which we're still working through, so can't verify Garmin's claims of 60 hours of tracking, but rest assured we're actively working on proper testing, and will update accordingly. The Garmin Fenix 5 is a still a superb multisports watch, which successfully packages up every element of Garmin's incredible array of specialist devices. For those who demand the best from running, cycling, swimming, hiking and even golf it's an unbeatable device. Of course, there are downsides. 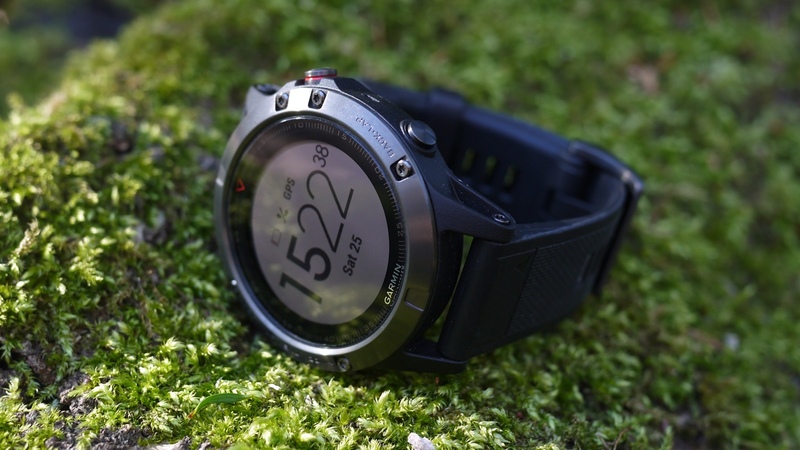 The first is price, but the Garmin Fenix 5 is essentially a 6-in-1 device – more if you count the options offered by Garmin Connect IQ. Our only real gripe is the optical heart rate sensor, that unlike every other aspect of the Garmin Fenix 5, isn't the gold standard. But for the truly active, the Fenix 5 is the best on the market. Ive opted to get the fenix 5x while my buddies got the Apple Watch...theres a lot of smack talking happening and we're looking for an app or platform which we can all compete in one place. Do you know of any that exists that allows us to put our money where our mouth is? You could try something like Inkin, which works with the Apple Watch and a host of Garmin wearables. You could also try out Strava and set up a club to keep that competition healthy!